Yet another cute card I designed for Hambo Stamps! I love this little flower pot - the pot and the flower are separate stamps (there are two other flowers that go with it!) I absolutely loooovvveee cool caribbean and chocolate chip together - two of my fav's! I made extra's of this card to put in some lunchpail tins that I am altering. Cute stuff! 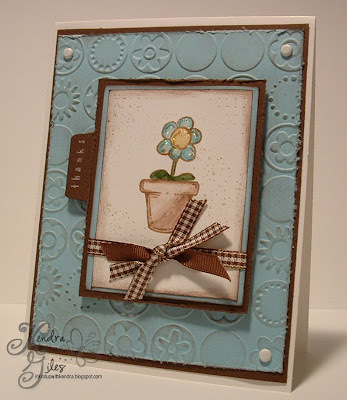 I adore my cuttlebug - the embossing folders just completely change the look of a card. 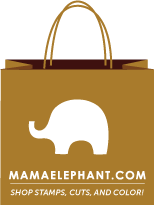 :) I am trying to work on some new stuff to post, but I have been soooooo swamped with card orders, lunchtin orders and swap cards that I can't even see straight! I always overcommit myself, but I wouldn't have it any other way - I think I work better under pressure! I'm thrilled you posted! :) Did you come up with the color combination on your own, or was it from a challenge? I have never used these two colors together, but think I should give it a shot after seeing your card!! Kendra you are making it very difficult for me to stay true to SU I cannot AFFORD to buy any MORE stamps!!!! These are way tooooooo CUTE!!! 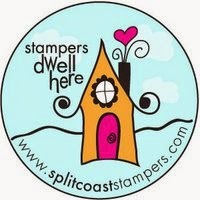 You are NOT allowed to get me hooked on another stamp company!!! LOL!! Way cute cards the last few days with your Hambo Stamps!!! Love your card. I also love those colors together. I agree. I think Chocolate Chip and Cool Caribbean look FABULOUS together. And, these Hambo stamps are just too cute. TFS!!! What a really cute card. I love it. I'm the same way, over committed, frazzled, just **barely** keeping all the balls in the air somedays, but can't seem to say NO to anything. ;-) I think I function better when I've got a list of one trillion things to do. Adorable!! I love that the flower & pot are separate ~~ I'll have to go check it out, thanks for the link!! I absolutely love, love, love your style. This card looks fabulous! I LOVE ALL YOUR CARDS, THEY ARE SO BEAUTIFUL. I AM GOING TO GO OUT ON A LIMB HERE AND SAY THAT YOU REALLY LIKE THE COLOR BLUE. I NOTICE ALOT OF YOUR CARDS HAVE BLUE. I LOVE THE BLUE AND BROWN COMBO! Kendra -- I've been looking at the Hambo site ....... okay, you've convinced me ..... MUST ORDER SOME!! I like the simplicity of the stamps and you have executed the designs to a tee!! I'm looking forward to meeting you in Arlington the end of the month. I'll be the one with Susan Liles (your blog buddy)!!! You are so talented! I love the image and the card all together is fabulous. The cuttlebug embossing is a great touch! Adorable card! Did you sponge ink on the cuttlebugged background? or use chalk? Like you, I love those colors together. Fantastic card! I love caribbean and chocolate chip together too. I just noticed how well this card matches your banner! Keep the talent flow coming. I'm hoping it will rub off on all of us who visit! I LOVE this card!! Everything about it is AWESOME!!! Keep making great stuff for all of us to admire! Super cute card - love the colors, coloring, and stickles! I NEED some stickles :0) Question...is it a pen, or a powder (like dazzling diamonds) or is it like a glue?? I loved the card but then, I love all of your cards. Great colors, fun stamps, and the cuttlebug is great. Am I imagining it, or are the embossed circles reminiscent of the SU set big pieces and little pieces, or what??? I don't have a cuttlebug (yet) but love what y'all are doing with it! Kendra, this is adorable! No wonder you are swamped with orders. Your stuff rocks! Kendra I'm loving your Hambo cards! Seriously awesome designs!!! What a cute card! I'm a big fan of the Cuttlebug folders myself! I also like the way you tie your ribbons - such a flair!